Solomon Success > Blog > Should Bitcoins Buy Real Estate? King Solomon never saw a Bitcoin, but his timeless words of wisdom on money and prosperous living apply even in this digital world. And as the upstart digital currency hits the world of real estate, it’s time to remember his advice from Proverbs 2:3-4: “Incline thy heart to prudence,” he says, and “seek her as money.” You can buy a house with Birtcoin – but is it a prudent thing to do? Bitcoin’s splashy entrance into the real estate market came with the announcement in the spring of 2014 that the owner of a Southampton NY property priced at nearly $800,000 was wiling to accept cash in traditional funds for the property or the equivalent in Bitcoin. The German-born owner of that Southampton property isn’t the only one willing to take the controversial virtual currency for a real estate transaction. Sellers in Indonesia and Latin America, where Bitcoin is big, are also letting buyers know they’re willing to take Bitcoin for real estate purchases. The hostility of major financial institutions and governments toward Bitcoin and other digital currencies like it has triggered fears among some Bitcoin supporters of a major effort to kill the coin entirely.Others point to the continuing spread of the coin into areas like real estate as evidence that it’s here to stay. 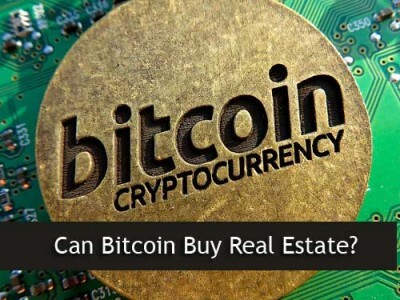 But while conducting a transaction like buying real estate with Bitcoin seems simple, it may not be. But the very anonymity of Bitcoin makes it hard to create safeguards around such a sizable exchange. Bitcoin is backed by nothing, and its value, as we’ve seen, can change dramatically in a short time. A hundred thousand dollars’ worth of Bitcoin today may be worth a hundred, or a thousand, in the next few months, leaving the seller with no return at all. Another obstacle in using Bitcoin to buy real estate is the number of ancillary transactions that go along with any kind of housing sale. Inspections, title searches and transfers, legal fees and permits are all a part of buying am investment property – and those entities probably won’t accept Bitcoin. So funds for those transactions will have to be carried by the parties involved, even if the main sale is done via Bitcoin. For now, Bitcoin transactions for real estate have been limited to relatively expensive properties, ones that could equally easily be purchased with cash. And cash is still king in some kinds of real estate purchases, pushing out those buyers who have to work with lenders to take out a mortgage. Should you get on the bandwagon? The answer depends on a lot of considerations. If you’re a Bitcoin enthusiast who wants to help promote its use, there’s a growing list of sellers willing to meet you halfway. If a property you want can only be had by Bitcoin, it’s relatively easy to get some. Bitcoins can still be “mined” – produced using the complex algorithms that set the number of Bitcoin circulating. If you don’t have the patience, computer power or expertise to mine Bitcoins, simply sell something for Bitcoin or pull out your real wallet and buy some Bitcoins from an exchange.